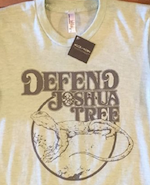 Here’s the website-in-progress for the Joshua Tree Downtown Business Alliance, an open-membership group that is appealing the Planning Commission’s decision re Dollar General in Joshua Tree to the San Bernardino County Board of Supervisors. This site features info on what we’re doing, why we’re doing it, what’s at stake, and how we can win this. Time to get lobbying! This entry was posted in Dollar General, Dynamic Development, Joshua Tree Downtown Business Alliance and tagged Dollar General, Dynamic Development. Bookmark the permalink.